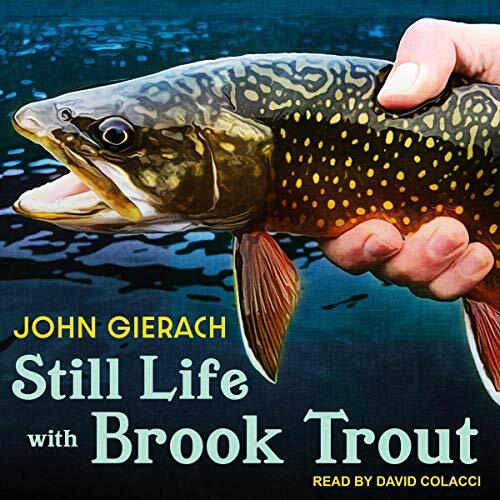 In Still Life with Brook Trout, John Gierach demonstrates once again that fishing, when done right, is as much a philosophical pursuit as a sport. Gierach travels to Wyoming and Maine and points in between, searching out new fly-fishing adventures and savoring familiar waters with old friends. Along the way he meditates on the importance of good guides ("really, the only thing a psychiatrist can do that a good guide can't is write prescriptions"), the challenge of salmon fishing ("salmon prowl - if they're not here now, they could be here in half an hour...or tomorrow...or next month"), and the zen of fishing alone ("I also enjoy where my mind goes when I'm fishing alone, which is usually nowhere in particular and by a predictable route"). On a more serious note, he ponders the damaging effects of disasters both natural and man-made: drought, wildfires, and the politics of dam-building, among others. Reflecting on a trip to a small creek near his home, Gierach writes, "In my brightest moments, I think slowing down...has opened huge new vistas on my old home water. It's like a friendship that not only lasts, but gets better against the odds." Similarly, Still Life with Brook Trout proves that Gierach, like fly-fishing itself, becomes deeper and richer with time. I do love the fishing yarns. the new narrator is ok and if you're use to the other Gierach audiobooks, you will probably be a little disappointed. Still pleasant to listen too.